Time flies when you are having fun… right? The Universe says HELL YES! When you are having fun, not only does time fly, but you raise your vibration. Your vibration is what helps support your intentions - your dreams, your desires… all the things you are co-creating and manifesting with the Universe. Of course, the Universe is crazy powerful, but your boost of vibration speeds things up, creates clarity, feeling, intention and faith around you. What better way to be to receive all that is flowing to you. Now go out and have some fun today! 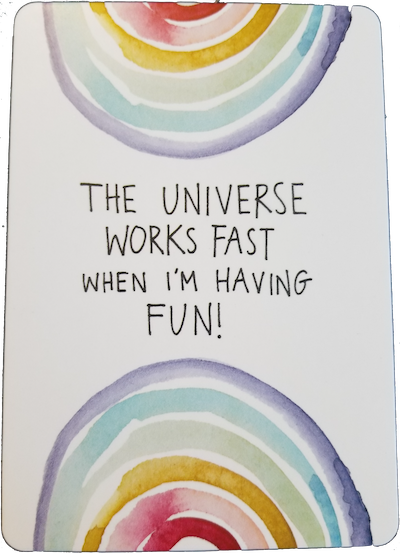 *This week’s deck is the Universe Has Your Back Deck (affiliate link).